I spent a little time yesterday, preparing my new Leader-Ender pieces. 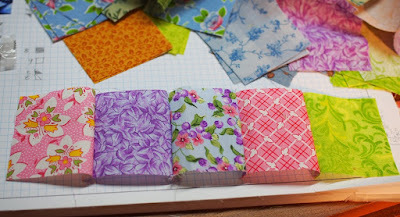 The leftover 3½" x 1½"scraps were put in a tray along with a heap of 1½" squares, and I'll sew those together one at a time. This cleared a lot of snippets out from the strip drawer, which is a good thing. 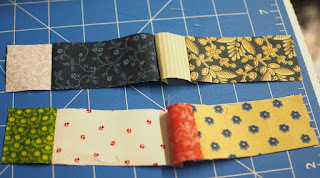 I sewed 1.5" strips onto 3.5" strips. and that will make arranging them on the design wall easier. At a rough count, I would need at least 720 units for a single bed quilt, so there's a lot of stitching to do before I'm anywhere close. That's fine, I'm in no hurry. While I was cleaning out drawers I found a heap of 3.5" strips that needed dealing with, along with containers of leftovers from two projects. 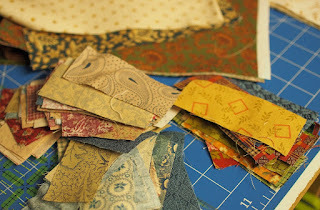 Those scraps measure 3.5 x 1.5" and are leftover from my Cracker quilt, and a cross quilt. Time to do something with them instead of putting them back in the drawer. I'd been thinking of doing a Plus quilt, they are everywhere at the moment, and this quilt plan of Mary's came to mind. 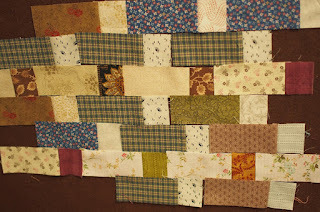 She is stitching it as nine-patches and spacer strips, but it can be pieced entirely out of strips and squares. This would be a good pattern for my odd collection of leftovers; I can strip-piece the long scraps, and just sew squares onto the already cut pieces, so it should use up all the leftover bits. 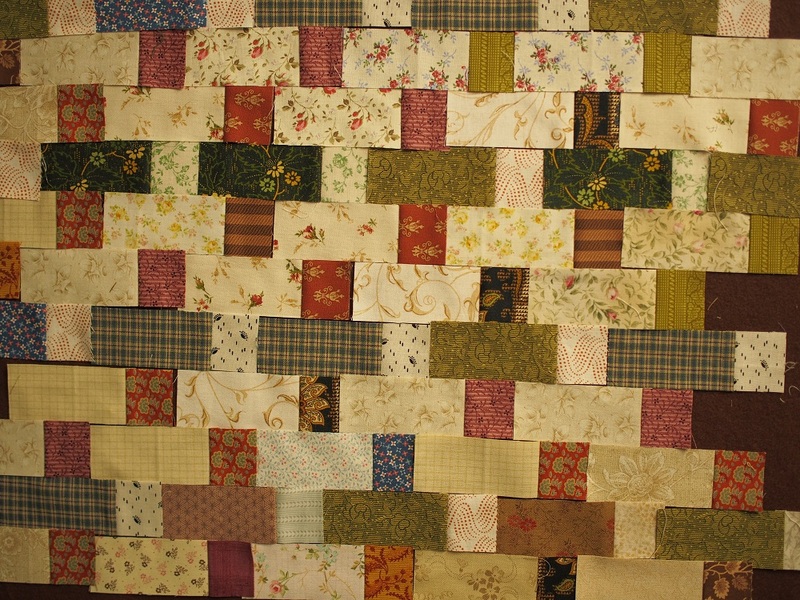 I sewed several strips together, cut them into 1.5" slices and threw them on the design wall. The dark Plus signs float on a light background, and there are no seams to match. Cool. They don't look like normal Plus signs now because of the seam allowances, but they will once the rows are sewn together. I liked it enough to keep cutting, and then decided to try it with light coloured Plus signs. I like that too, so this is going to be my new leader-ender for a while. I will have to sew hundreds of these little units to make a decent size quilt, so I'll be able to mindlessly join them and worry about the placement of them later. I'll decide later if I want light or dark Plus signs; all I need to do now is sew strips to squares. Normally we spend at least two months moaning and complaining about the horrible summer weather, but not this year. There have been horrible days, but not weeks of it like we usually have. There is only one week of February left, and only three hot days predicted, and then that's the end of summer 2016. I know, we sometimes have have high temperatures well into April, but I can handle those because Winter is approaching at last and the cool weather is in sight. The dogs have been much more comfortable this year, being able to stay outside in the shade instead of locked in the A/C. It's been a lovely summer, compared to some of the shockers we've endured. I kept thinking about the fabric numbers from my spreadsheet, and wondered what 93metres of fabric actually looked like. How much have I actually removed from the stash, in terms of sheer bulk? So I pulled out a heap of pieces that I knew were full FQs, or 1m or 2m cuts. 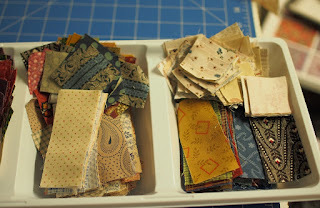 When I got to 50m the cutting table was full, so I figured I should just imagine two lots of this, gone from my stash. Well Done, Me! 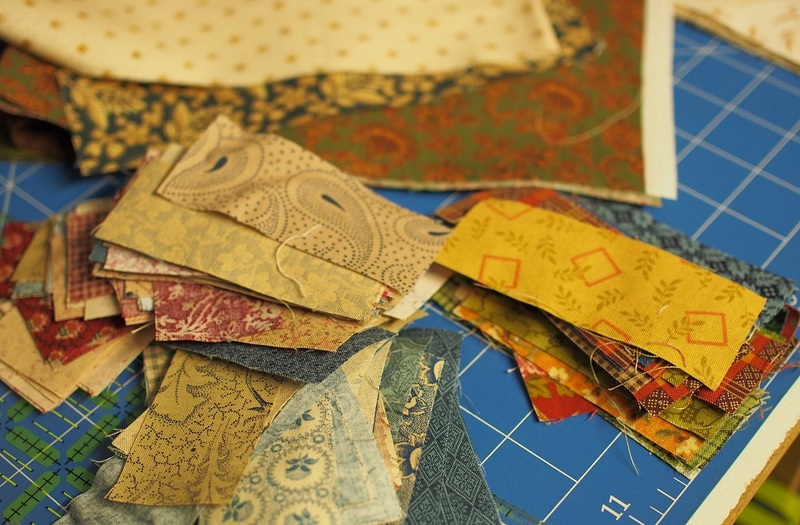 It was an interesting experiment; that is a LOT of fabric to have shifted, but it's a mere fraction of the overall stash. 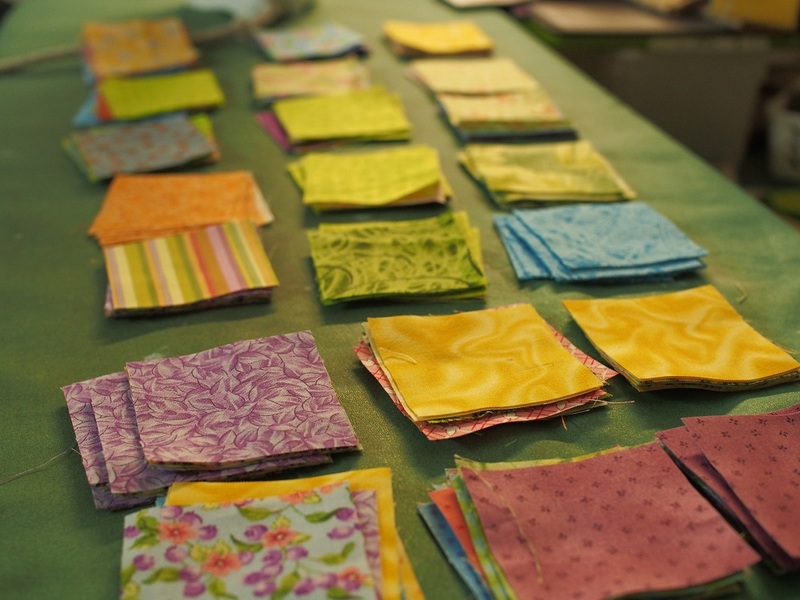 I would like to keep reducing my fabric on hand, and 50m a year sounds very achievable. My aim now is to stack up 50m of fabric to sell, or use in backings, or to give away. I have an Enormous parcel chugging across the seas towards me, and I need to make room for it on the shelves. 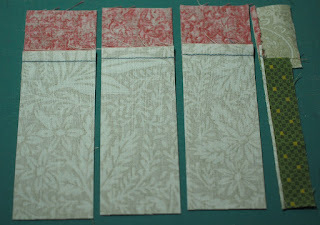 First thing this morning I ran a row of stitching around the edge of the borders of the Sister's Choice, so that all those seams are held secure. They can come undone so easily while it's being loaded on the longarm, so now I won't have to worry about that. it was a nice idea, but I have fabric that would have looked just as good. Why doesn't this sort of thing occur to me Before I start? Never mind, it's cheerful, big, and most important of all, Finished! Well the top is. This is the third finish for this year, and a total of 23m of the stash used. 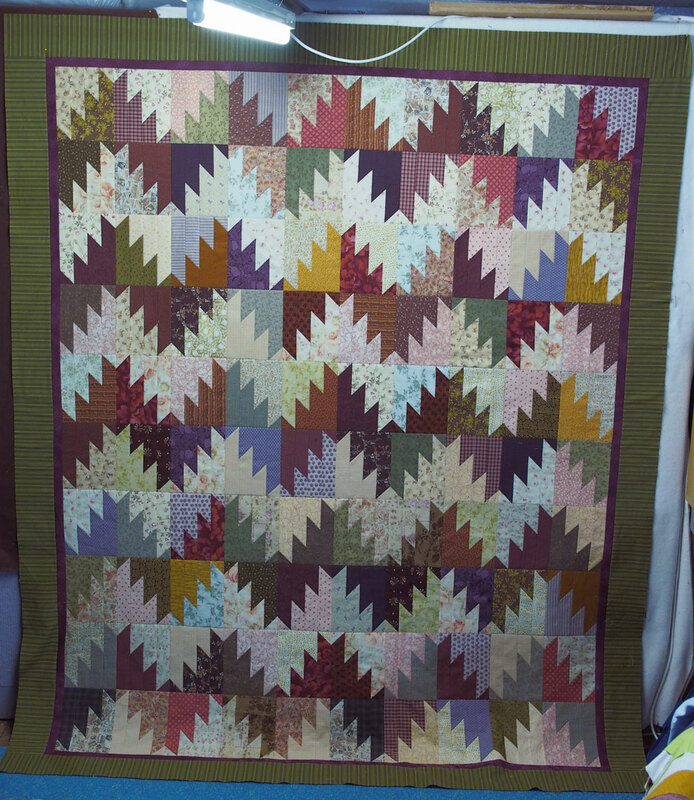 Unfortunately there have been a couple of trips to Spotlight and the Jamestown patchwork shop. 25m has been added; I'm a bit appalled at so much, so soon in the year. The total is only going to get worse, because I was very, very bad at Hancocks the other day. I will have to find backings for about 10 quilts to wipe out that fabric debt. When the parcel gets here I'll be equal parts shocked and happy. It's Operation CleanUp here, I have to set the sewing room to rights before I start dragging more fabric out and making another mess. I'm going to shift a few things around, just because I'm bored and want to see something new. It will be the same as the pieced border; I'll get halfway through and think it's a really bad idea, but I'll have to go through with it. At least it will be easier to vacuum all the hard to reach place while I'm moving furniture. 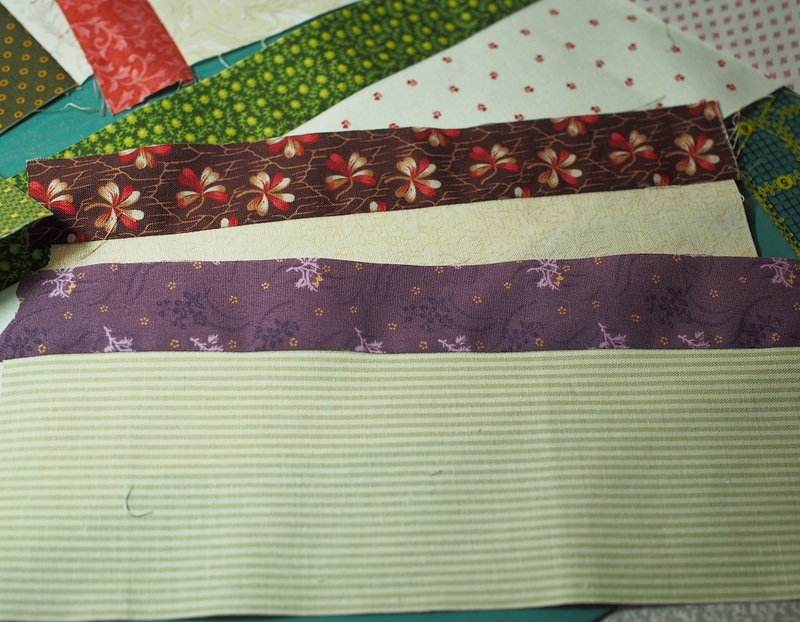 I spent a ridiculous amount of time today trying to choose borders for my Scrappy Mountain Majesties quilt. I pulled dozens of fabrics out of the cupboards and drawers, but nothing seemed perfect. 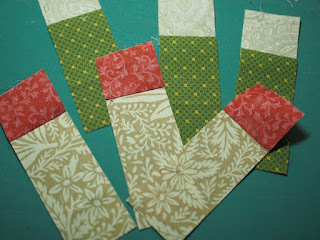 I even cut and pieced the strips from one fabric, but then I just couldn't bring myself to sew them on. Mereth's stash was raided, and she gave her opinions, but I still couldn't make a decision. Finally I chose one, and the strips were cut and attached in half an hour. 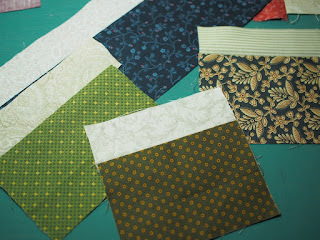 It's so annoying that it took me all day to sew on four borders! The light fabrics didn't photograph very well, they are more colourful than this photo. The fluoro light makes it hard to capture the colours accurately; it's a daylight fluoro tube, which seems to confuse the camera. 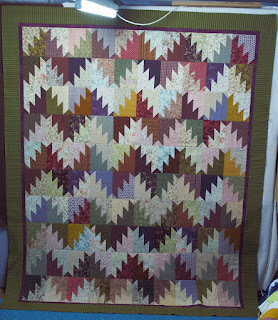 I will see if I can get a better photo down in the workroom tomorrow. 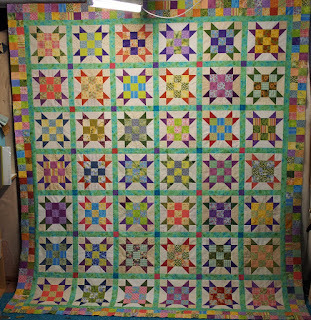 The bright Sister's Choice is finished as well, but I'm too shattered tonight to get it ironed and up on the design wall for a photo. I'll do that tomorrow. I have no idea what to sew next, I might just sew some strings together on the Tiffany treadle for some mindless sewing. 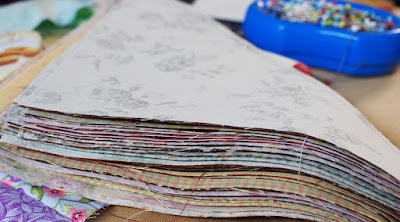 I've been sewing steadily away at my two projects, but neither is anywhere near finished. 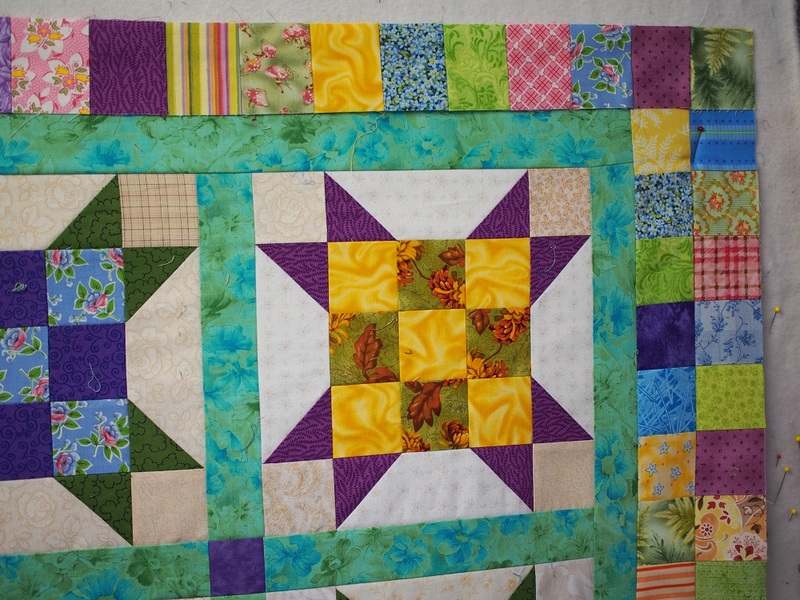 I attached two borders to the Sister's Choice, but there are still two to go. 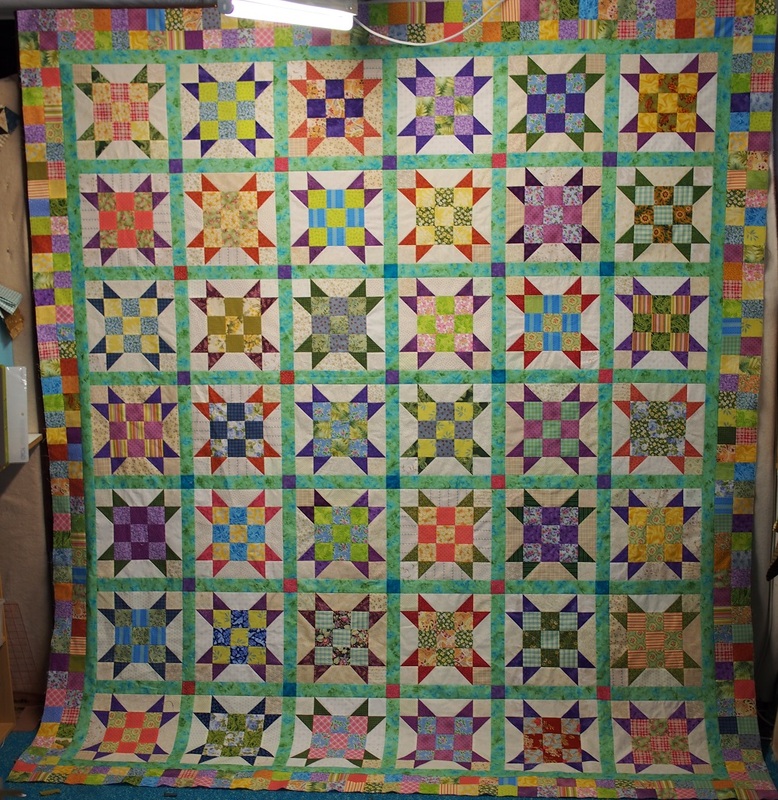 I cut twice as many squares as I need, so hopefully there will be plenty of variety; I need to make 3 strips of 40 squares each. If I concentrated it would be done in an hour, I'm just not very focused lately. 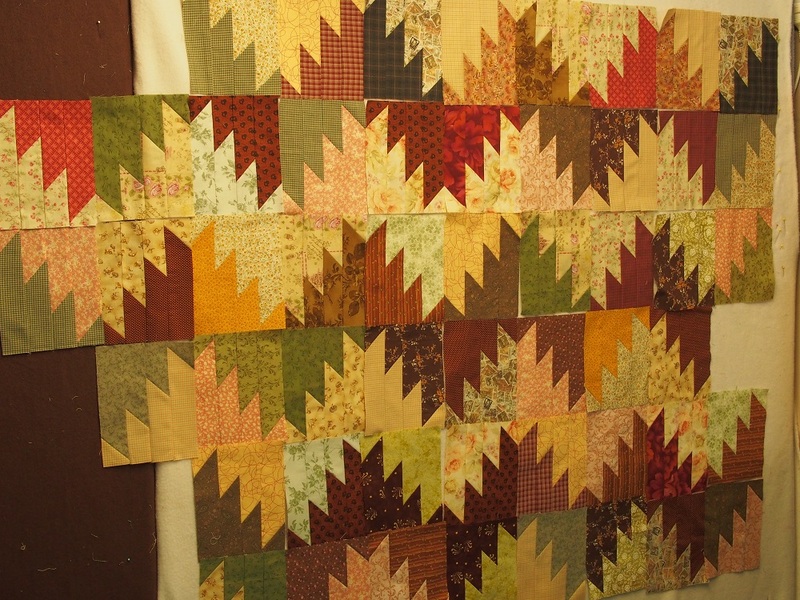 My Scrappy Mountain Majesties blocks have multiplied since I took this photo; I need another 12 blocks and then I'll have enough for a decent size quilt. 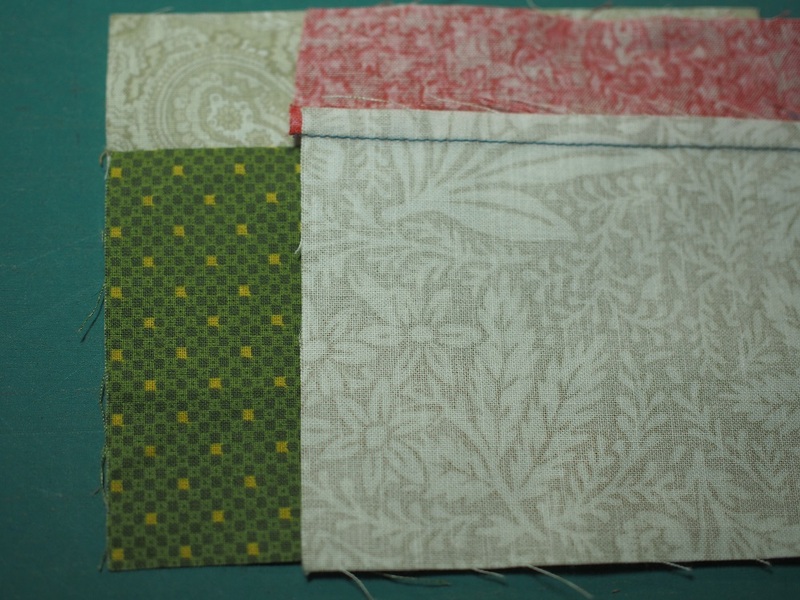 I'm determined to just slap two plain fabric borders on them and call them done. I'm fed up with pieced borders right at this moment. In an effort to use up the bright fabrics I cut 4.5" strips; haven't decided on a pattern yet, but this is all that's left of most of my pretty modern stuff. I'm thinking maybe something with rectangles, or big HSTs. I have some eye-popping brights from a scrap pack, but they are destined for a Chinese Coins with black setting to tone them down a bit. 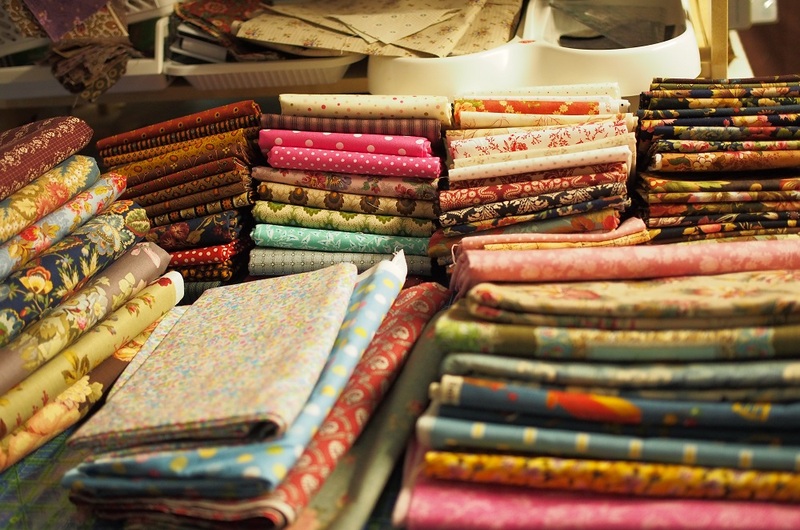 I'm determined to get this stash fabric moving! The weather has been most unusual lately, not like our normal summer at all. It's cool and rainy today, and it's been more than a week since the temperature went over 40. I'm definitely not going to complain, it's been lovely to have a break from the intense heat and dryness. 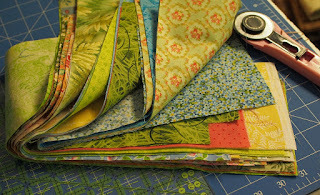 The rain is taking care of the garden, and excusing me from any outdoor chores, so it's a sew-day for me. 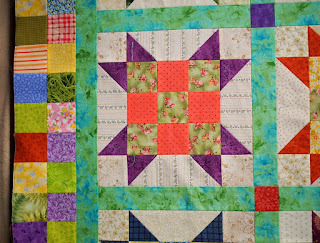 I don't think my plan of a double row of 2" squares was very clever; I sewed together all the pieces I had, and it made enough for 1 border. It's going to take a lot more time than I thought; it's back to the cutting board this afternoon, amassing enough squares for the other three sides. 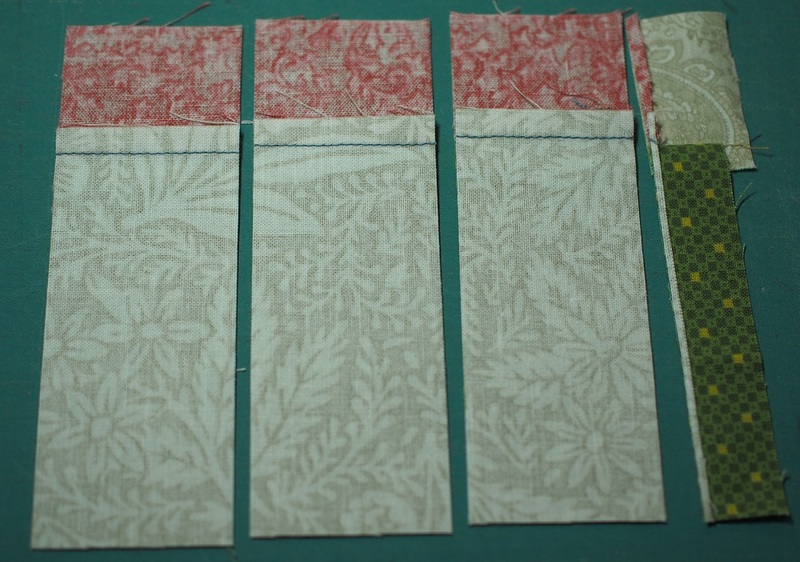 I'm sewing them together in sets of five; each is 10" long, making it easy to calculate how many I need. 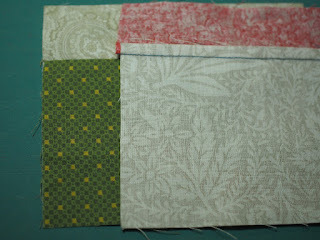 I'll mix them up on the design wall so that I don't have all the same fabrics in one spot. It's going to take a while. 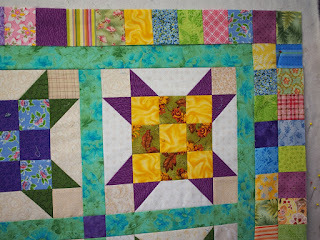 And I thought this quilt was as good as Done! 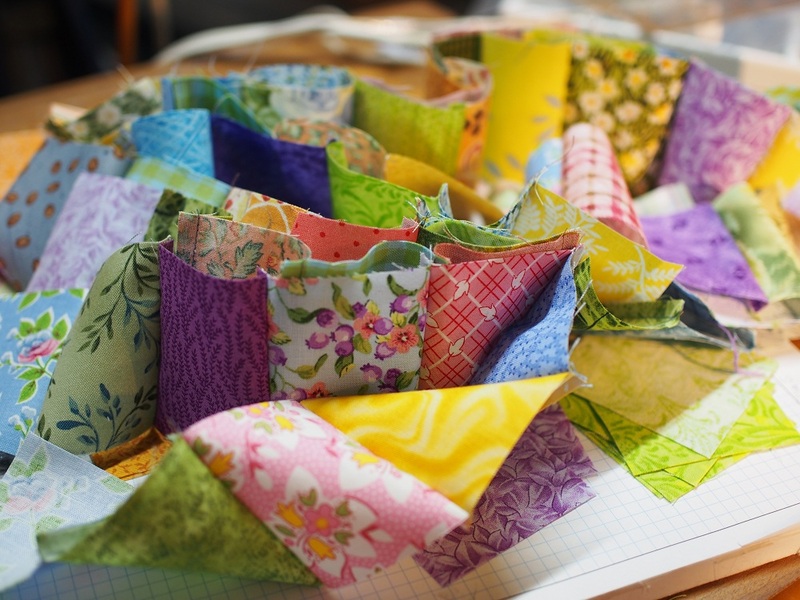 I quickly sewed together another 20 pairs of triangles and I will have to find time to iron them, and recut them for the Scrappy Mountain blocks. 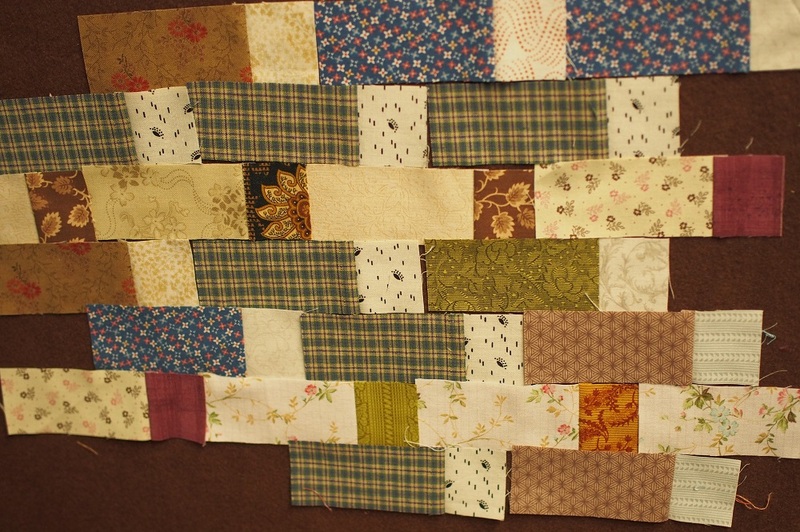 I should need only another 10 pairs of squares after this, for a lap quilt. Once I have them all on the design wall I'll decide if I want to make more of them in this collection of fabrics. The block is so fun and easy that I could see me making another straight away, in blues and browns and greens. Three years ago I planted two blood plum trees, and watched them grow, trying to be patient. Last Spring they set their first fruit, admittedly not much, but for two weeks I've been able to eat a Satsuma or Mariposa plum, fresh from the tree. 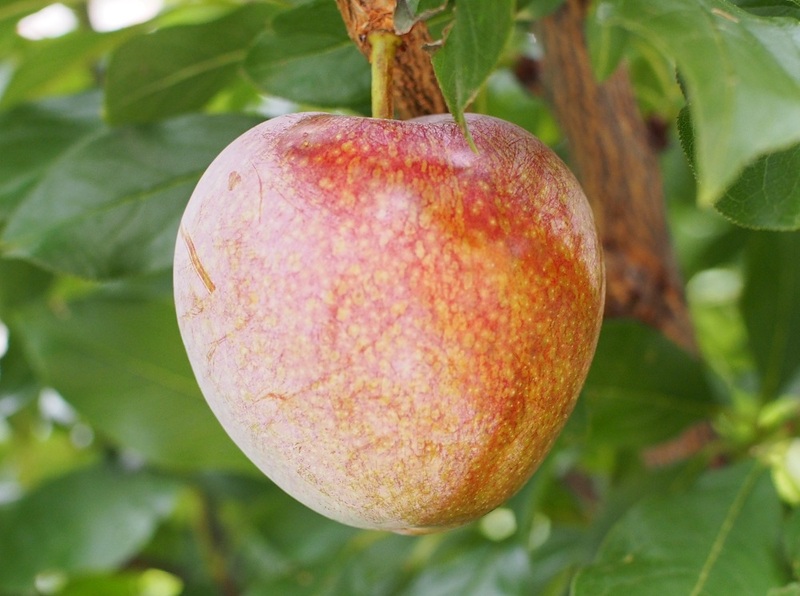 It's been a delight; you would have to threaten me or my family with bodily harm before I'd eat a European plum, but Satumas are divine! The Mariposa is there to pollinate the Satsuma, it's OK but not as good. Hopefully next year I will have enough fruit to eat and share with family, before the birds realise there's a new tree on the block.